The rule is one of the many that American troops serving abroad are innately aware of. Orders are part of a soldier’s life, meant to be lived, breathed and obeyed. When Lt. Colonel Jay Kopelman entered Fallujah in November 2004 at the height of the fight for the Iraqi city, he had no idea he would end up breaking an order in such a direct way. Kopelman had been charged with training a group of Iraqi soldiers, part of the effort to form a new national army that would eventually take over from American forces. It wasn’t going well. The men were scared and noncompliant, a situation made worse by the language barrier. When Kopelman arrived at a house in the city being used as a command post, he was exhausted and edgy. Just days before, the Lava Dogs, a Marine unit based in Hawaii, had taken control of the compound. They discovered the puppy, only a few weeks old but spunky and looking for fun and a fight. They gave him part of their rations, let him bite at their boot laces and tried to ignore that they were violating the rules. To understand the rationale for the order in GO-1A, one need only examine the landscape of war-torn Iraq. Canines are not kept as pets in traditional Iraqi society, but rather as working animals for sheepherders and the like. Once the war began, the number of stray dogs exploded. With strays on the rise and no one to care for them, dogs turned to eating the corpses that littered the streets. Diseases spread. For an efficient military, the simplest solution is to shoot the strays on site. Kopelman isn’t ready with excuses for why he decided to play into the plan. “It’s not like you wake up one morning and say ‘I’m going to violate the regulations,’” he says. But in an intense combat atmosphere where death is faced head-on every day, something, he says, has to give. Kopelman made a promise to the young Marines in the unit: he would personally make sure Lava got back to the United States. It was no easy promise and one he wasn’t entirely sure he would be able to keep. Today he says he isn’t sure what would have happened if his commanders had learned about Lava. The events that led to the puppy’s arrival in the United States read like an espionage novel. 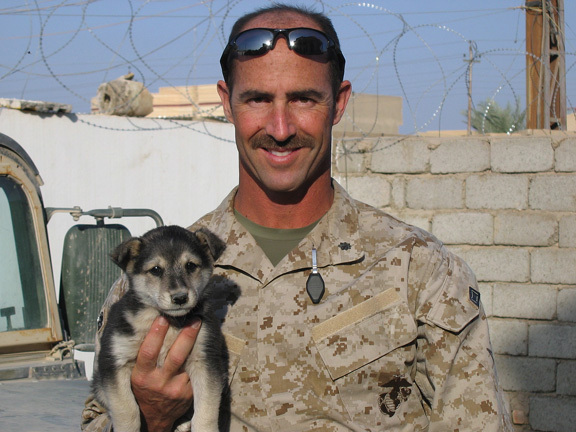 In the ensuing weeks and months after his unofficial enlistment, Lava was cared for by the troops providing security for the base’s commanding general. Eventually he went to live with a National Public Radio reporter stationed in Baghdad. Meanwhile pressure was mounting on Kopelman to come up with a plan to get the dog back to the states as the time neared for him to return home. The Marines who had discovered him wanted to send Lava back to their home base in Hawaii. But a strict quarantine on animals going to the island state rendered that scenario virtually impossible. What was clear though was that the dog needed an international passport declaring a clean bill of health to get out of Iraq. Assistance came from a kindhearted Iraqi man who successfully worked the system with the help of several veterinarians. 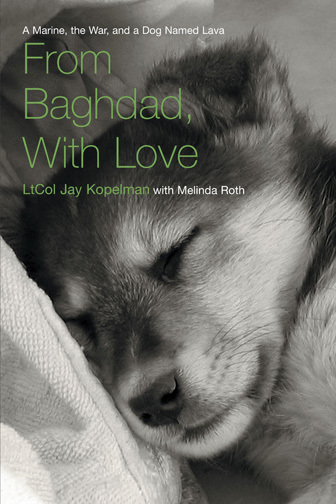 Eventually, with his puppy passport, Lava traveled from Baghdad to Aman, Jordan and from there to Chicago. Once in the United States he made his way to San Diego to live with Kopelman.